The Trump Foundation looks like a personal piggybank. It’s supposed to be a charity. It looks a lot more like a personal piggy bank. 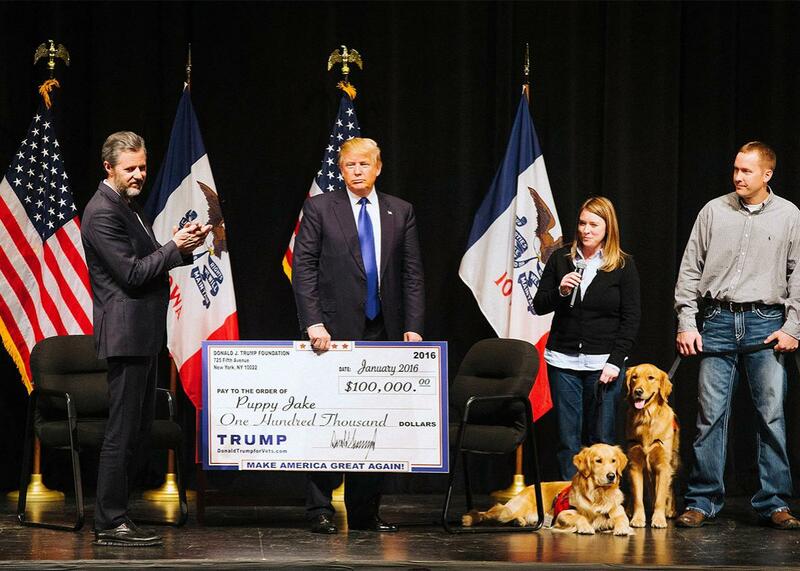 Donald Trump (center) joins Jerry Falwell, Jr. (left), for a campaign rally in which Trump presented a check to the Puppy Jake, on Jan. 30, 2016, in Davenport, Iowa. Taxes play an important role in any presidential election. The candidates make tax proposals, reflecting their views on the proper role of government. Sometimes they hem and haw about releasing their personal tax returns. This presidential cycle has added a new wrinkle: the question of whether the candidates have misused their tax-exempt foundations. While both Hillary Clinton and Donald Trump have faced allegations of impropriety in this regard, suggesting some sort of equivalence, there’s only one there there: One candidate’s public charity has devoted significant time and energy to solving serious problems around the world, with no evidence of actual misconduct, while the other’s private foundation looks for all the world like a scam. The Donald J. Trump Foundation has raised very little money over the years and appears to have done little in the way of charitable giving. That’s not the scandal, however. More troubling is the way in which Trump has funded his foundation and then used its resources. Thanks to the dogged reporting of David Fahrenthold of the Washington Post, we now know that Trump has apparently directed those who owe him money to donate to the foundation. He has then used money in the foundation to make political donations, buy a portrait of himself, and, even more disturbing, to settle personal and business disputes. That behavior evinces a shocking disregard for the law—one that makes Trump’s boasts about fighting to pay as little income tax as possible even more ominous than they initially sounded. First consider those “donations” from people who owe Trump money. Tax law is quite clear that those who earn money and direct that it be paid to others owe tax on that income—even if they direct that it be paid to a nonprofit foundation. Because Trump claims to be under audit by the Internal Revenue Service and has refused to release his tax returns, we cannot know whether he properly reported all of this income—$2.3 million of which was reported on by the Washington Post this week. The Trump campaign told the Post that the candidate did pay taxes on a $400,000 donation that Comedy Central made as payment for Trump’s appearance on a roast, but would not say if he paid taxes on the rest—payments for goods and services from a man named Richard Ebers amounting to $1.9 million. If Trump did not pay taxes on that income, he is left with two arguments. First, he could claim—as a Trump advisor did to the Washington Post—that he sometimes waives or disclaims income he has earned, and the people who would have owed him money just happen to donate those precise amounts to his foundation. If you buy that, I’ve got a bridge in Brooklyn I’d like to sell you. Second, Trump could also argue that he would have been entitled to an offsetting deduction for making the charitable donation—so no harm, no foul. However, there are limits on how much one can deduct, and if Trump really has managed to shrink his tax liability to close to zero, as many suspect and he seemed to admit during the debate, he would not be entitled to an offsetting deduction for income taxes. Moreover, some of the money earned and donated might have been subject to payroll taxes, for which no charitable deduction is available. Again, such a claim could easily be verified if Trump would only release his tax returns, as past nominees from both parties have routinely done. Trump’s apparent use of the foundation as his personal piggybank raises far greater concerns. When money is contributed to a foundation, it becomes the foundation’s money, and it can only be used for charitable ends. Has Trump followed suit? When the national press reported that the Trump Foundation had made a prohibited $25,000 donation to Florida’s attorney general just as her office was considering suing him over the activities of Trump University, it was somewhat plausible to brush it off as an innocent mistake. Maybe he wrote the check from the wrong account! And the timing? Pure coincidence, as Trump has claimed. And sure, when the Post reported that the foundation had purchased a portrait of Trump for $20,000 that ended up hanging in one of his properties, you could have pointed out that it was won at a charity gala and that the money did go to charity. When it was reported, however, that Trump used his foundation to donate hundreds of thousands of dollars to settle his own business disputes, only the most blinkered Trump supporter could fail to see a very disturbing pattern. Trump puts himself forward as a sophisticated businessman who understands how the world really works. As he said in this week’s presidential debate, he understands money. I say we take him at his word. If I worked at the Internal Revenue Service, I would refer Trump to the Justice Department for a criminal investigation. Obtaining a criminal conviction for violating the tax laws isn’t easy, because you need to show intent—ignorance is a defense. But given Trump’s self-proclaimed sophistication, it is hard to imagine he didn’t know exactly what he was doing.